As soon as I opened the file, I could feel the bitterness rising in me. Maybe it was the impersonal greeting [INSERT FACULTY MEMBER’S NAME]. Perhaps it was the realization that the title of adjunct is discouraging enough without the new adjective of “unranked.” Possibly it was the two pages of provisions and requirements connected with a contract where the university wants both my commitment and their right to offer no guarantee. It’s probably not so much about this letter as it is about experience with a long list of universities. Low pay that can be cut in half if the university fails to recruit enough students, or can be canceled without any notification. Expectations of work without a contract because of the wait for enrollment to increase, no gas allowance for out-of-town locations, no desk copy of the textbook, no help to pay for teaching materials, and good luck finding your way around technology. Letters that have long lists of what is expected of me, of what I am not eligible for because I am not legitimate faculty, and references to mysteriously absent handbooks. My slow but sure realization that excellence in teaching is not appreciated and in one case got me in trouble because my evaluation numbers were higher than the numbers of the person who hired me. It is not so much about being mistreated as it is about being stuck. I am a fairly pragmatic person who when faced with a problem immediately looks for what I can do to make it better. But this situation can’t get better. Universities need to squeeze out as much revenue from graduate programs as possible, and contract instructors are a dime a dozen. If I were going to make this work, I would have to become satisfied with doing a sloppy job so I could improve the work to pay ratio. I would have to learn to play the game. But instead, I feel bitter. And I must confess that sometimes bitterness feels good. Bitterness comes when I think I am purely a victim with no accountability for my actions. Bitterness feels justified when I think I have tried everything I can to remedy the situation and still it persists. Bitterness tells me that it’s all about me and my pain, and my perceived injustices. Bitterness can be as addictive as anger, or hate, or self-pity. When I turn to scripture to seek a remedy for bitterness God’s word is both clear and condemning. These verses from Ephesians show me there is no justified bitterness. It looks like the bitterness option is off the table; likewise anger, slander, and even clamor. If I can’t spew anger, call people names, and cry out for sympathy then there isn’t any point. Or so it would seem from what the world tells me. My bitterness grieves God. Jesus died for my redemption, and my bitterness says that amazing gift is not enough. It tells God I would prefer to model the behaviors I see on social media than live in the grace of God’s love for me. God is not telling me I cannot be sad. He gave us emotions to help us learn, to help us understand each other and to help us understand ourselves. But,when I turn that sadness, or frustration into bitterness, I am no longer looking to God for help. Not only that, but bitterness is one step away from contempt and contempt destroys relationships. Bitterness is as unhealthy as it is ungodly. Instead, God asks me to be kind, tenderhearted, and forgiving. The world tells me this is not a healthy response. I should stand up for myself, seek confrontation, and believe in myself. If I don’t look out for me, no one will. Here the scriptures tell me that God’s way is not the way of the world. My bitterness can lead to no good. My reliance on God, my realization of His love and protection, and my trust in His righteousness will lead to all the good I need. I have been reading The Screwtape Letters with a group of friends, and one idea I found in this book that was new for me was that sometimes our misery is part of our service. It is not that God wants us to be miserable. It is not even that we deserve to be miserable (which we do.) It is learning how to trust God to shepherd His flock with justice -- even when we are miserable. Bitterness is not mine any more than vengeance is mine. My work is to eat the grass, stay close to my flock, and listen for the Shepherd’s voice. 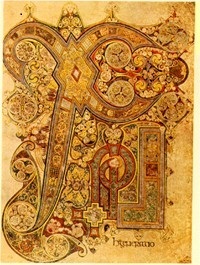 This picture is a recreation of a famous Chi Rho from the Book of Kells. The Book of Kells housed at Trinity College in Dublin was one of the incredible things we got to see in Ireland. It is thought to have been created by monks in around 800AD. It was a labor of love to create it, and another labor of love to preserve it from the perils of Viking attacks and the exposure of time. These superbly crafted copies of the four Gospels tie us to a group of fellow Christians from many years ago. We may not understand all of the symbolism but we do know is that these Christians honored the name of Christ as we seek to do the same in our worship and in our life. If I speak in the tongues of men and of angels, but have not love, I am a noisy gong or a clanging cymbal. And if I have prophetic powers, and understand all mysteries and all knowledge, and if I have all faith, so as to remove mountains, but have not love, I am nothing. If I give away all I have, and if I deliver up my body to be burned but have not love, I gain nothing. Pastor Will supplies his cell number at the beginning of the sermon encouraging us to text him. When he explained to us that the Greek word for kind in this passage could also be translated as useful, it made me look at the passage in a whole new way, and I got so excited I tried to text him. But, then it took me so long to type that I realized I was missing other good stuff and changed my mind. Texting during sermons is apparently for a different age demographic. Kind is vague. We can be kind without any emotional commitment. Kind can be misunderstood. Sometimes when I think I am being kind, my words or actions are not received in the way they are intended. Kind can be wimpy. It doesn’t seem to be a characteristic that inspires strength or respect. But useful. . . That is something altogether different. Useful has to be specific, empathetic, and strong, or the action does not live up to the name. If I help someone by doing something useful I have made a commitment to making their life a little bit better. If I want to be useful, I have to think about what the other person actually needs, rather than what I might be willing to do or say. If I am going to be useful, then I need to make more of an investment in my actions and words. I really like this translation of Chréstos. “Love is patient and useful” is my new favorite verse. Now, what I was thinking during the sermon -- the idea that I couldn’t text to Pastor because my thumbs type slower than my brain thinks -- was what if we applied this to social media posts? When Christians are on social media, we have ample opportunity to show love. However, social media does not promote the patient side of love, nor the useful side. We too often quickly shoot off a reply or share a meme. Even if what we post is kind, is it useful? So, what does it mean to show useful love on social media? It is probably easier to start by identifying what is not useful. Even when we are passionate about an issue -- even when we are right to be passionate about an issue -- it is not useful to post something that is derogatory, simplistic, untrue, or mean. It’s derogatory if it insults – even if that insult is deserved. It is simplistic if it discusses a complicated issue and in so doing puts everyone on the other side of the issue in the worst possible light. It is untrue if it assumes that a group (such as the far left, or the far right) is plotting to destroy all human morals. It is mean if it speaks law and does not even consider grace. Law without grace is useless. I know when I have posted things like the examples listed I was convinced that my passion and my “rightness” would magically persuade people to see my truth. I have come to realize that even when I am on the moral side of the issue -- even when scripture supports my view -- my passion is still steeped in sin. I need grace and so do my social media contacts. We all need forgiveness. So, how can our love be patient and useful? I suspect it has to do with action. Instead of posting something derogatory about an opposing candidate, I can make sure I vote and encourage others to do the same. Instead of posting something untrue, I can seek out information on the other side of the issue to learn more about the people who believe what I do not believe. Instead of sharing a simplistic meme I can interact, face-to-face, with people who have different convictions than me. Instead of thinking the ends justifies my meanness, I can step away from my computer (or phone) and do something helpful, something, patient, something kind. God created preachers to help us understand His word, but He asks all of us to obey and live His word. Our words are nothing. Our actions, when motivated by the realization that we have been forgiven and brought into the family of God, are useful because God makes them so. The Greek word Chréstos is close to the same word commonly used as the name for a slave. I am no longer a slave to the law. I am a servant of Jesus and my fellow humans. It would benefit me to remember that the chi that starts the word Chréstos connects me to the Chi Rho that is the symbol for Christ. My words, my tweets, my posts, shared memes, and especially my actions, all speak to my understanding of what it means to be connected to Christ. It is likely you have seen this story, and perhaps you are cringing just a bit to see such behavior. 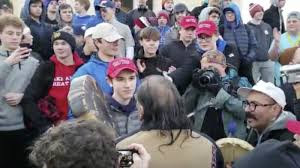 For some of these young men their clothing identifies them as students at a Catholic high school. Not only that, but they were reportedly in the area to participate in the Right to Life March. Here is a link with a more complete story than most sources. And here is NPRs update. First and foremost, we are all sinners living in a sinful world. Secondly, sin is not an excuse for ridiculing others or condemning truth and justice. And third, sin is not erased by brute force, by contempt, or a righteous cause. The only thing that defeats sin is grace. Why then, is the sin of a Christian different? It is certainly not any less consequential. Sin is selfish; it turns away from God. It is harmful to the sinner and others. It spreads and justifies itself. It seeks out others to join its cause. It is never on the side of truth. Sin is sin, and we must look it in the eye and call it so. Please note that sin is forgiven, not excused. Forgiveness is not about saying that “boys will be boys” or “we all do things in our youth that we regret.” It is important that confession precede forgiveness. We should note that confession does not have as its purpose the earning forgiveness, but instead the purpose of facing the sin head-on, of admitting to the sin, and of regretting it. God could choose to forgive us without confession, but His goal is more than erasing the sin. His goal is redemption. Once we acknowledge our guilt, we can walk the road through repentance. We feel the grief our sin has caused, and we carry that grief to the cross. At that point, we can experience the overwhelming power of forgiveness. Grace brings about change. Forgiveness is something learned. Once we have experienced the joy of being released from the burden of guilt we are then able to share that forgiveness with others. We can forgive sin, forgive differences in opinion, forgive different life circumstances, and even forgive ourselves. The experience of forgiveness and of forgiving others is a gift of grace that goes beyond our salvation. It is a gift for our life on earth. This love of God is what makes the sin of a Christian different. It is a sin that, because of the power and grace of God can lead to growth and change. Christians are not people without sin. We are people with the sure hope of redemption. Let us bring our sins to the cross and return with a spirit of forgiveness. I am too old for New Year’s resolutions. My mature wisdom tells me resolutions do not work unless anchored in strong emotion. Even a strong emotion is often not enough. Last year I set it as a goal to exercise more. I wanted to be healthier and to reduce my risk of falling. My YMCA personal trainer added cardio and weightlifting to my Tai Chi and walking regimen. I faithfully followed prescribed routines. By the end of the year, I find I have gained weight, my cholesterol is up, I officially have osteoporosis, and I fell and broke my ankle. I anchored that resolution in my desire to live a healthy and safe life, but that desire was not enough. In my case, even following through with action was not enough. I guess I was today-days-old when I learned life ain’t fair. Common sense tells us we should make New Year’s resolutions because it is not healthy to dwell in past failures. Instead, we should look to the future with optimism. Just because sense is common does not make it right. 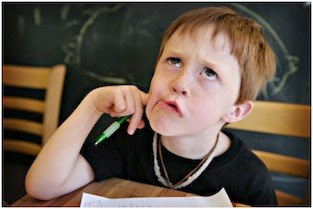 Research tells us that when we make resolutions and announce them to people, we are less likely to achieve those goals. When we reveal the decision, our brains produce those much sought after endorphins, and the brain is happy and ticks off that box. We need to go beyond the resolution and train our brain to crave the actual work of change. A better way to change is to remind ourselves of the flaws and failures that make us want to change. We need to remember our weaknesses to keep our brains from sabotaging our plans. But, the world tells us it is not healthy to sit in the despair of our failures. The answer is to understand the difference between guilt and shame. Shame tells us our sin makes us unworthy. Guilt tells us our sin makes us unworthy, but there is hope in forgiveness. In both a worldly and spiritual sense, change starts with failure. The next step is to own the failure. If you are of the world things can get stuck here. If you are a child of God, then there is a way forward. Guilt leads to repentance which is swallowed up in forgiveness. Our desire to change must start here and must include the power of God. That is the only power to change. Because of Jesus we no longer have to fear or deny our sin, failure, or weakness. We can see these aspects of our life as a way to move forward, a way to become stronger. This year, instead of making New Year’s resolutions, I will spend some time with the old year’s revelations of my weaknesses, failures, and sins. I won’t sit in that mess condemning myself – my sin has already done that. Instead, I will look to the mercy and grace of my God and know that He can, and will bring about change in me. May God bless your 2019 with growth!